"Working with several veterinarians I have been using the EQultrasound to treat a wide variety of musculoskeletal and lameness disorders. I have been very pleased with the repeatable results and it has become an integral part of what I do. The manufacturer provides great technical support." "We have seen excellent results in both acute and chronic conditions as a stand alone therapy. EQultrasound is one of the most effective therapeutic devices we have ever used. It is totally painless and excellent when used as an adjunct therapy, enhancing effectiveness of Shock Wave Therapy, Cold and Hot Laser protocols"
Longwave / Low Frequency therapeutic ultrasound for an effective treatment of muscles, tendons, ligaments, joints and bone conditions in horses. EQultrasound low frequency ultrasound therapy for horses produces the following effects within biological tissues: mechanical vibration, diathermy (deep heat), intense acoustic effects (stable cavitation, acoustical streaming and microstreaming). 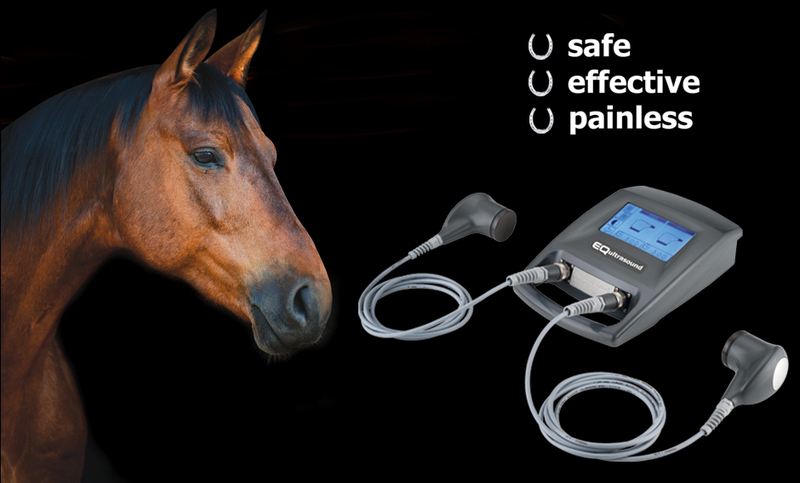 Compared to traditional high frequency equine ultrasound therapy (1/3 MHz), our longwave ultrasound (38 kHz +/-2 ) produces a much more effective and deeper action for a faster recovery in the treatment of equine muscles, ligaments, tendons, joint structures and bones. Through the use of six different hand probes, EQultrasound is able to modulate a wide range of frequencies, so that with the same device several different muscular, tendinous, joint and bone equine pathologies can be treated, both in the acute or chronic stages.